alaTest on kerännyt ja analysoinut 203 arvostelut lehdistä ja verkkosivustoilta. Keskimääräisesti, käyttäjät antavat tälle tuotteelle arvosanaksi 93/100. Samsung Q9FN review: We love OLED TVs, but Samsung's latest provides a robust counterargument and makes a compelling case for LCD. One of the most impressive TVs in recent memory. 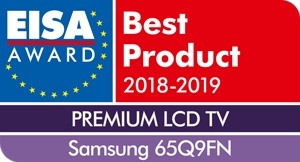 The Samsung Q9FN is the best LED/LCD TV we’ve tested thanks to its superb picture quality and outstanding ease of use. It’s the whole package, and you’re going to want one. Samsung's high-end Q9 delivers the best picture quality of any non-OLED TV on the market, scads of features and sweet design. So can it knock off its OLED rival from LG? More expensive than OLED TVs with superior image quality. Bixby can't compete with Alexa or Google Assistant. Not available in a 55-inch size. The Samsung Q9 is an amazing performer with exquisite design and loads of extras, but it costs more than OLED TVs and doesn't perform as well. The Q9FN TV proves Samsung's QLED technology can go toe-to-toe with OLED, with the widest color gamuts we've seen in a consumer display. Very wide, accurate color. Strong contrast for an LCD TV. OneConnect box adds flexibility for wall mounting. Smart TV platform with voice assistant and smart home controls. Expensive for a non-OLED TV. Samsung's Bixby is no Alexa or Google Assistant. Bottom Line: The Q9FN TV proves Samsung's QLED technology can go toe-to-toe with OLED, with the widest color gamuts we've seen in a consumer display. Samsung's impressive QLED TV is a significant step forward for the technology. Verdict: Unprecedented colour and brightness combine with the LED world’s best backlight controls to deliver the finest HDR pictures seen to date. Samsung's Q9FN TV offers better blacks than last year's model, and is arguably the best TV on the market. The series is also a lot less expensive than it was last year.